These game controllers cost like 20 euros a piece in Finland promising to be total replica of the original SNES controller. Well what can I say, the plastic feels like totally cheap material. Maybe that is not the most important thing though, so how about the buttons? I bought two of these. Another had one button (L or R cannot remember) totally unusable. Like it was placed too deep in the ditch, feeling it was pressed down all the time. Cross-controller didn't work well to high-left very well. Another had totally unresponsive cross-controller to high-right and slightly bad A-button. 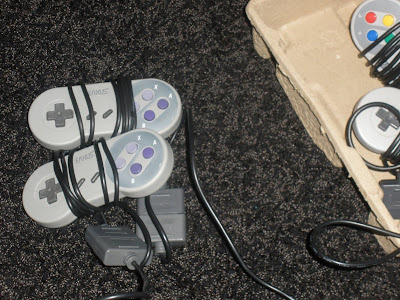 Comon' these are supposed to be brand new and they already felt like worse than my wear out old original controllers. I made a complaint and returned them by mail - wishing a working replacements. The result? Perhaps slightly better working two pieces still with some unresponsiveness and generally cheap feeling in them. I would not recommend EAXUS controllers to anyone unless you want to do some lottery on which buttons work this time and which won't. Or maybe if you can get a piece for few euros but not 20e - by some luck you may get decently working controller. The four pieces had just so many flaws it's unbelievable for a brand new product. I could see just by looking for it that some buttons are not properly placed, like one of the controllers had cross-controller set too deep which made it unresponsive and bad for a thumb - way to go.